Jim and Peggy Henson dominated the Buckeye Car Shows of the past with their hot plum passion 1982 Chevrolet El Camino. Jim passed away this year. Peggy must carry the load now just like the Ford Ranchero pickup or as Ford Australia coupe provided, “a vehicle to go to church in on a Sunday and carry the pigs to market on Monday.” After 15 years of showing the El Camino, this October 7, 2017 9 a.m. to 1 p.m. will be the final appearance of the 1982 Chevrolet El Camino with crosshatch grille flanked by rectangular headlights. The Buckeye Oktoberfest Car Show will be at the Buckeye City Hall Plaza and parking lot at 530 East Monroe in Historic Downtown Buckeye, Arizona. There will be a First Prize for each class and Best of Show. All participants bring their spiffed up trucks, imports, motorcycles and bicycles at 7 a.m.- 9 a.m. to register. Are you from Arizona, if not how long have you lived in Arizona? I am not from Arizona. I was born in Nebraska and at the age of 13 I moved with my family to Idaho. I left Idaho in 1978 to settle in Arizona. What year and model is your El Camino. Does El Camino have a name? The El Camino is a 1982. No, “she” doesn’t have a name. Is your El Camino original or custom? 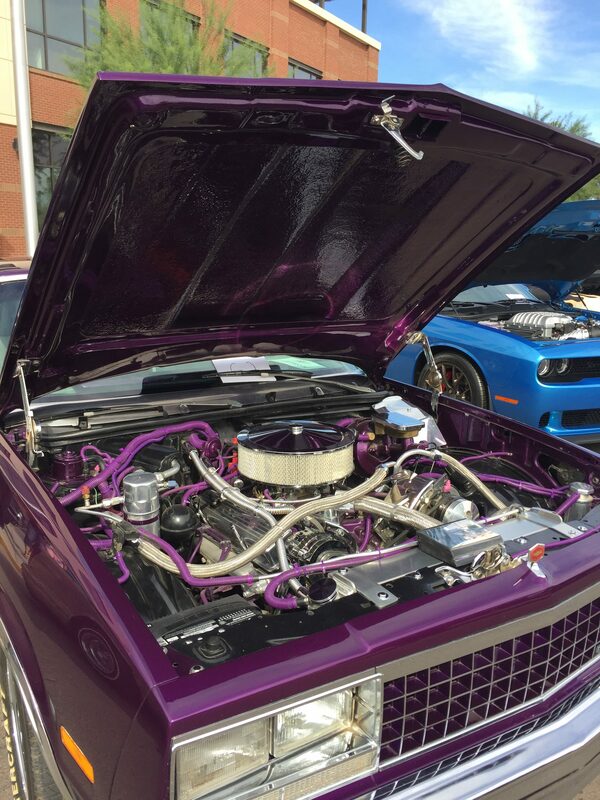 What makes the El Camino custom is first of all, the beautiful Plum Passion DuPont hot hues paint. The chrome in the engine compartment is blinding or at least eye catching. The turned steel dash is unusual but I think adds a classy touch. Much of the detail was Jim’s vision and it just so happened I liked his idea about nearly everything. This beauty will be sold this year to someone I hope will care for it as much as we did. It’s just not the same without Jim, may he RIP. Do you always wear purple? Why do you love purple so much? I always wear purple at the car shows. I only like a rich deep purple like the color of the El Camino. Most other shades of purple I do not care for. When you take your El Camino for a spin, what tunes are playing? Radio station would be Kool 94.5 or I could be blaring a country CD. What do you like best about the Buckeye Car Show? We began to show the car during its restoration about 15 years ago. Settling in Arlington, Buckeye was the closest car show. I like Buckeye’s car shows because the people are friendly and easy to talk to. I think David and his group has done a good job keeping the show moving and interacting with the crowd. Wow, great post. 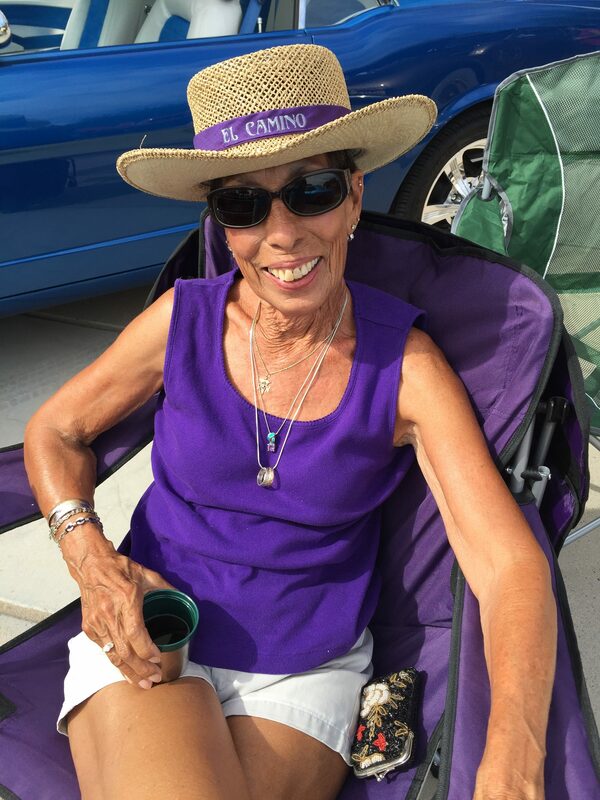 Thanks for sharing us the story of the person behind the wheels of Purple El Camino. They are the legend in the Buckeye Car Show. Its sad that Jim is not there anymore.